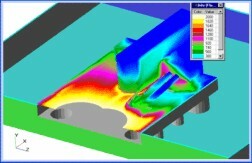 FlowVision is a new generation simulation system for solving practical CFD problems. The modern C++ implementation offers modularity and flexibility allowing addressing the most complex CFD areas. Unique approach to grid generation (geometry fitted sub-grid-resolution) provides natural link with CAD geometry and FE mesh. The ABAQUS integration through Multi-Physics-Manager supports the most complex fluid-structure-interaction (e.g. hydroplaning simulation of automotive tire). The hybrid modeling concept provides possibility to use multiple solvers (in different parts of the simulation domain) to fast obtain the most reliable simulation results.